Have you ever thought about a new use for an under-used structure in your park? How about a resident artist in your park? A cafe? A place to store tools for your Park Friends group? 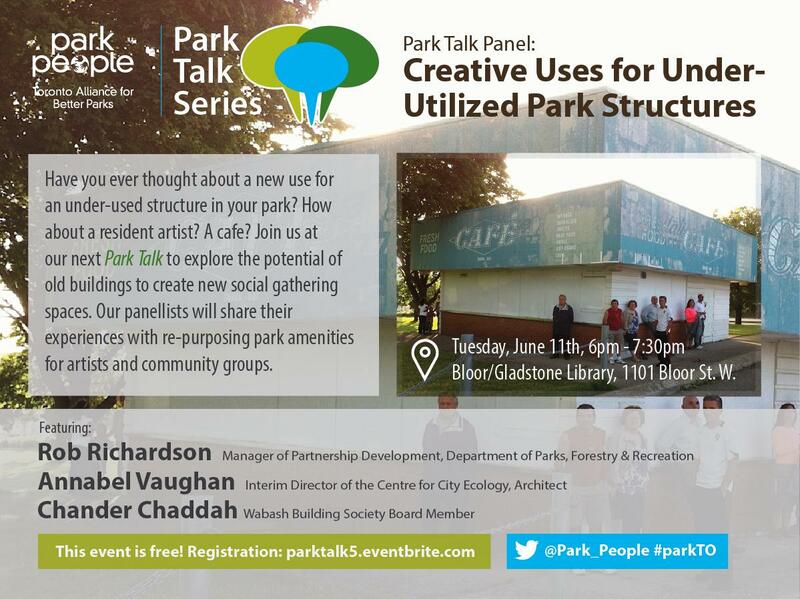 Please join us at our next park talk at the Bloor Gladstone Library at 6 pm on Tuesday, June 11th to talk about how to use old buildings to create new social gathering spaces. Our panelists will share their experiences with re-purposing park amenities for artists and community groups. This is your chance to brainstorm your idea with Parks Forestry and Recreation, Park People, Park Friends groups, non-profits and others. Hope to see you there!